14th of February each year is a day for the loved ones. The day exclusively meant to express one’s love and affection for the people we love. This day assumes special importance for the husbands and wives to tell each other how they have loved one another for all the years they have been through their married life. For others, it is the day for the lovers to express their love through gifts, specially red hearts. Besides, cchocolates and flowers are also the popular gifts – but some also add jewellery. On this day, some of the classic movies like Gone with the Wind, Dr Zhivago, From here to eternity, Casablanca, An affair to remember, Roman Holiday, The Princess Bride, when Harry met Sally, Romeo and Juliet and many such movies dedicated to the lovers are seen and remembered. Why the day? There are many legends and stories attached to it. According to one legend Valentine, who was a priest during the third century in Rome, came forward for the rescue of the young men and women, when Emperor Claudius II decided that single men made better soldiers than those with wives and families and outlawed marriage for young men. Valentine, reacted to the injustice, and continued to perform marriages for young lovers in secret. When Valentine's actions were discovered, Claudius ordered that he be put to death. And so the day is celebrated in the name of the slain priest by young women and men. In Pakistan, people have mixed emotions in celebrating the day. A majority of the young boys and girls want to go along in its true spirit for expressing love and affection for each other. As for married couples, the young couples also go along, while the older ones think it is meant for younger generation only. Those a bit religious, say it has no relevance in our religion for the reason that we need to love each other throughout our lives and should not find a special day for its display. So whatever, contention suits who, people do celebrate it with much enthusiasm. 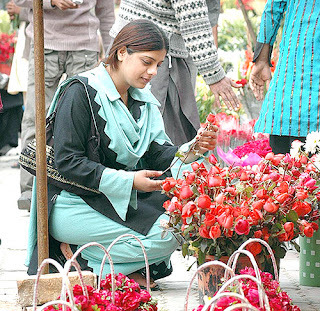 Even people in Peshawar, which is considered a bit conservative area, are also found flocking shops selling flowers, cards and other gifts related to the lovers’ day like people in any other city of Pakistan. At least the day provides a break form the horrific news we hear about the political turmoil in the country, the on going war on terror and the rising poverty. Culture is controversial or are we making it controversial? Every tradition has it origins somewhere and I don't believe it really matters where it started. Valentines day is a day to profess your love. True enough if we love someone we should do it every day but Valentines day acts as a reminder. Sadly today I am a long way from my love. Nice point brought up by Peter Dickinson. BTW, distances don't stop you to 'profess love.' Do they? I agree with both Peter and SAJS. Love must be expressed before it is too late.